The Association of Applied Geochemists hosts regular international symposia and plays a significant role in other events. This page serves as a source of information and material from these events. The 29thInternational Applied Geochemistry Symposium (IAGS) will be held in the “Garden City” of Viña del Mar, Chile in November 9-13, 2020. The city of Viña del Mar, in central Chile, is located 120 km northwest of the capital city of Chile, Santiago. It is a well-known tourist destination, famous for its beaches, the neighboring world heritage city of Valparaiso and abundant parks. The city lies west of the coastal cordillera in which wineries thrive among the valleys, together with other productive activities that include gold and base metal mining. The location of Viña del Mar provides easy access and represents a great starting point for pre and post conference activities, including field trips and social or tourist activities. Chile is an easily accessed country. Its international airport is well connected world wide, and most nationalities do not require a visa for entry. The official language of Chile is Spanish, but the official conference language is English. Information about the conference, venue, program, workshops, and pre and post conference field trips will provided in early 2019. The AAG co-sponsored the Australian Geoscience Council Convention in October, 2018. Click here for more information. 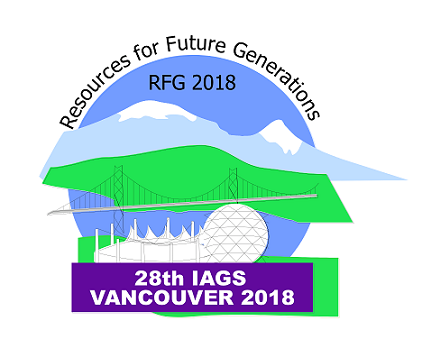 The AAG partnered with the Resources for Future Generations 2018 Conference held in Vancouver, BC, Canada in June 2018 to hold the IAGS2018 symposium as an integral component of the RFG18 conference. The 4 day conference covered Energy, Minerals, Water and the Earth. This conference provided the AAG with the opportunity to showcase through specific AAG sessions, the advancements and applications of geochemistry in the spheres of exploration and environment. More information can be obtained from the RFG website (http://www.rfg2018.org). AAG-related abstracts from RFG are available here.